You make decisions every day, but when it comes to business decisions, how you make those decisions can help determine your success. Do any of these stories sound familiar? Your team agrees you’ve found the perfect person to fill a new position, but the discussion continues for weeks. You’re then frustrated to find out the candidate took a role with another company because they hadn’t heard back from you. You and others have spent more than a month discussing and debating options on how to move forward with a key project. Then, you find out your project leader made the decision weeks ago, while you were still discussing the options. You’re excited to outline a new strategic direction for your group, but you don’t know who to engage or how to decide on final objectives. In each of these scenarios, projects were affected by how well their team could make and execute decisions. While working as a leader or team member, I’ve observed how different decision-making styles hamper or improve the outcome you’re going for. I’ve found the following tool – influenced by Tannenbaum and Schmidt’s leadership continuum and Vroom’s decision models – invaluable in proactively thinking through a decision before it happens. This helps me determine which style best supports the desired outcome. 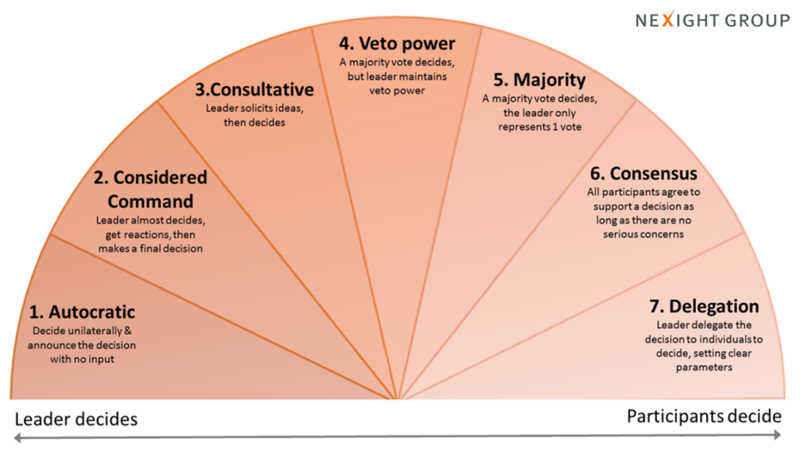 The tool outlines a spectrum of decision types, and takes into account the roles of the leader and other participants in the decision-making process. Autocratic (Style 1): Use this style when a decision needs to be made quickly, or it’s not important the participants bought into the decision. However, this style does rely on the leader to have the experience, expertise, and information needed to make the best decision. Consultative (Styles 2 and 3): These styles are more useful when buy-in by the participants isn’t necessary and the participants don’t have the expertise or experience to make the decision. To avoid any confusion or frustration, leaders need to specify how much participants may influence their final decision. If the leader already has a couple of clear options in mind, then style #2 may be a better selection than style #3. Majority (Styles 4 and 5): Use these styles when a large number of participants need to come to a decision, and expertise isn’t as necessary. The leader is the facilitator. However, these styles can be susceptible to groupthink and those participants with the experience and expertise to inform a good decision and those who have less experience will have the same influence on the final outcome. This means the majority may go in an unrealistic or unexpected direction. The leader needs to be clear about whether she or he has veto power, which can help counter any imbalances in participant experience or an unrealistic direction. Consensus (Style 6): This style takes the longest amount of time, but is useful if the decision requires participant buy-in. It also assumes that the group members have the expertise and experience needed to make the decision. This style works particularly well when there isn’t a formal structure or leader that will ensure the decision is implemented effectively. Delegation (Style 7): This is the simplest of the styles, but it requires the leader to think through the scope of the decision and to clearly communicate the parameters. This decision-making style ensures buy-in. It can be used when risk is low; individuals have the necessary experience; and there are limited cost or time factors that would be affected by a longer decision-making process or varied individual choices. There are some best practices that apply to all of these decisions styles. I recommend sharing the decision-making style with the project leader and participants at the beginning of the process. This will allow you to best support the leader and help participants understand and meet expectations. This can also prevent future conflict between the leader and participants and minimize challenges that arise when the decision is implemented. Effective decision-making requires practice and comprehensive planning. The decision styles tool included above can help you become more aware of different decision styles, incorporate them into your processes, and best reach your desired outcomes.